Kolam is an ancient folk art form that is still practiced daily on the floors of Hindu Temples and on the doorsteps of homes by the women of South India. Using rice powder, crushed stones and spices, as pigments, these dry powders are held in the hand and dropped to the ground by sifting between the thumb and forefinger. The designs symbolize "welcome" and invite all things auspicious to enter within. The primary motif consists of a grid of dots surrounded by a meandering line. These "wave" designs, as they are called, with their twists and turns, reference the endless flow and ultimate unity of life. Their impermanence is a reminder of the transitory nature of the material world. I was introduced to Kolam while still a graduate student at Rhode Island School of Design by a professor who had recently traveled to India. He showed me a small booklet on Kolam that he had purchased at a train station and I was immediately taken by the designs. They seemed to have a relationship to my own artwork as well as to contemporary art and art history. A few years later I was fortunate to be able to travel to India myself via a Fulbright grant to photograph Kolam designs in the towns and villages of the South. Thanks to the Lipkin Endowed Chair, this exhibition brings together selections of those documentary photographs originally taken in 1980 of Kolam and related Indian art traditions, with research and new artworks completed in 2011. 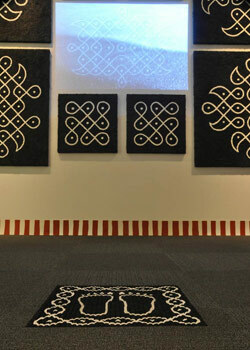 These new works were inspired by Kolam and also explore the possibilities of new media. The techniques and methods used include drawing, painting, sculpture, installation, video, 3-D animation, virtual drawing, and augmented reality. NCC student artworks based on Kolam from Fine Art studios, Communication Design classes, and workshops are also on view.